One of several residential colleges at the University of California, San Diego, Eleanor Roosevelt College (ERC) had been dispersed throughout the university; this project consolidates the college into a “campus within a campus,” with the goal of encouraging exploration and discovery. 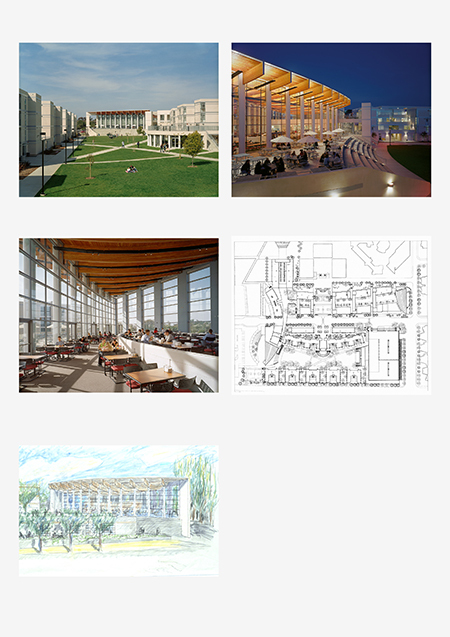 Located on 11 acres overlooking the Pacific, the college deploys new building typologies and landscape areas in an array of spaces including residence halls, apartments, dining and meeting facilities, academic offices, computer labs, a five-level parking garage for 1000 cars, and the International House. The west side of ERC is organized around a campus green—an expanse of lawn intended as the school’s main outdoor congregating area, anchored on the north by the dining hall and flanked by residence halls and apartments. On the east side of the campus, a promenade—the principal pedestrian spine—is similarly bordered by housing and is partially roofed by bridges that contain apartments. This portion of the campus culminates in the Great Hall of the International House at the south end and, at the north end, the provost complex, which includes offices and classrooms. Accommodating 450 students in residence halls and 740 students in apartments, ERC provides a variety of unit types, including flats and townhouses. These buildings have an earthquake resistant wood-framed structure. The exterior skin is a traditional three-coat stucco cladding, relieved with control joints at metal bands. Appropriate to the Southern California climate, the upper-level apartments enjoy roof terraces with ocean views. The lower levels feature sunken gardens, communal courtyards, and pedestrian streets.